Sorry about the increased time between postings, we had been waiting for additional feedback from the team before we presented you with these two views of the finalized design. Changes have been made to respond to suggestions from the structural and mechanical engineers, to simplify construction, reduce cost and generally hone the design. We decided to open the second floor south wall to expose the steel substructure and sheath it in translucent glass to provide overall protection, shading and privacy. Our thermal modeling showed that it would not change the temperature balance in the heat or cold, so we thought it looked great and it added to the consistency between the second and fourth floors. The fourth floor canopy was modified to allow the overall design to provide a more symmetric relationship with the lower structure and simplify the construction process. Instead of having a separate canopy (as provided in earlier drawings) to fabricate and install separately, it will now be integrated as part of the modular structure. The schematic diagram below is the visualization of the power generation and HVAC system I described in my post "getting to zero" a few weeks ago. While it might look like a plate of spaghetti, this diagram actually has been simplified to leverage the combination PV/thermal solar collectors to provide electrical power to the POWER TO LOAD (better know as the house) and hot water to the thermal storage tank. That hot water will be used to heat and cool (via the absorption chiller) the house with fans blowing over the coils. A small electric powered boiler and demand hot water heater will provide backup. Last night I presented the vision for Redhook Green as well as these renderings to a group of my new neighbors in Redhook at the The Redhook Economic Development Association meeting. Steve LaMorte, a RHED board member wrote me today, "As you can see, there is a good deal of interest coming from the neighborhood for your respective projects (the other being the Beautiful Earth Group). 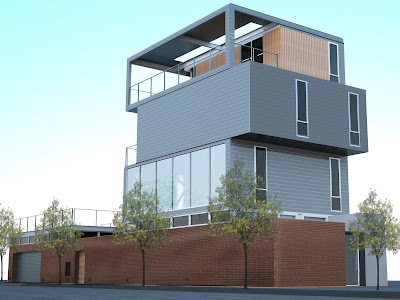 There's a palpable level of excitement that is growing around the changing face of Red Hook. 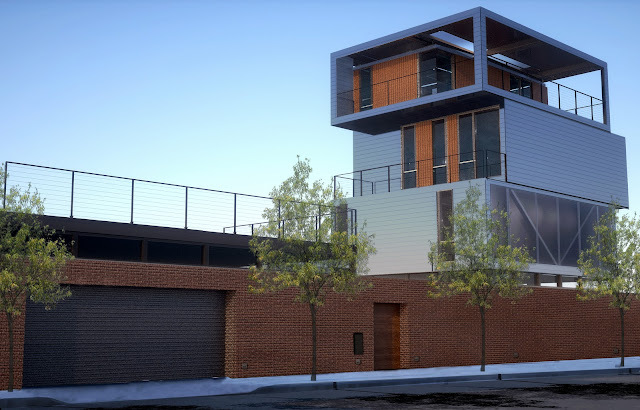 We believe your projects are going a long way in helping us define the new identity of Red Hook and we're hopeful that they will aid in galvanizing other like-minded environmentally conscious entrepreneurs to also find a home in this very special and unique neighborhood." I am glad to be part of this great community! Great Jay, looks even better. It will be interesting to track your long term affect on your neighborhood. They are lucky to have you.